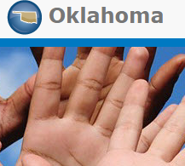 OKLaw is a joint project with Legal Aid Services of Oklahoma, Inc., the Legal Services Corporation and Pro Bono Net. Our goal is to provide the public with easy internet access to basic legal information and legal resources in Oklahoma. Want more information? OKLaw E-News! You can also request a speaker on a civil legal topic for your group. For further information about the OKLaw web site, contact the webmaster at feedback at laok.org. We cannot reply to requests for legal advice or assistance. To see if you are eligible for help from Legal Aid Services of Oklahoma, Inc., please see our web site at http://www.legalaidok.org and click on the Apply For Help link on the left-hand side of the page. Pro Bono Net is a unique collaboration among the various parts of the public interest legal community, organized primarily in New York city. They use information technology to increase the amount and quality of legal services provided to low-income individuals and communities. Probono.net is not only a company name, but also a domain name, which pro bono advocates can type into their internet browser in order to access extensive legal information and to share their information with other advocates working for disadvantaged communities.